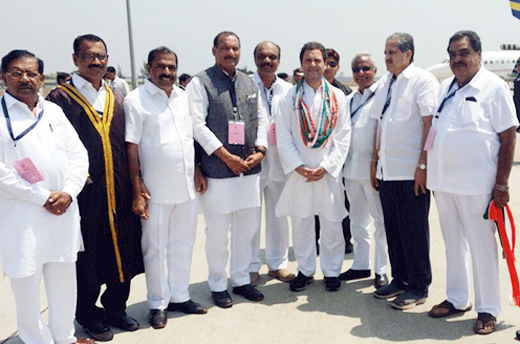 Mangaluru, Mar 20, 2018: AICC President Rahul Gandhi arrived at the Mangaluru International Airport at around 11.30 am on March 20, Tuesday by a special flight. He was accorded a warm welcome by Chief Minister Siddaramaiah, AICC in-charge of Karnataka Affairs K C Venugopal, KPCC President Dr G Parameshwar, senior leader Mallikarjun Kharge, DK District in-charge Minister Ramanatha Rai, Mayor Bhasker Moily, MLC Ivan D’Souza, MLAs J R Lobo, Moidin Bava, DCC President Harish Kumar and others. Deputy Mayor Mohammad K, AICC Member and former mayor Kavitha Sanil, Deputy Commissioner Sasikanth Senthil and City Police Commissioner T R Suresh were present. Later, Rahul left for Thenka Ermal by a helicopter. Chief Minister Siddaramaiah and G Parameshwar also accompanied Rahul in the helicopter. Kharge and State Minister DK Shivakumar travelled to Thenka Ermal by another chopper.